WE RECENTLY WERE AWARDED AN INTERNATIONAL 1ST PLACE TROPHY OF THE TOURIST AND CULTURAL VIDEO OF CANNES, 'NEW CALEDONIA - WHERE DOES THE SUITCASE COME FROM" WINNERS OF THE GRAN PRIX "TOURIST DESTINATIONS". I MUST ADMIT, THE CASTING ON THIS ONE WAS SUPERB AND A CREDIT TO THE DIRECTORS AND PRODUCTION COMPANY ALONG WITH STANDBY PROPS AND POST EDIT WHICH FELL INTO PLACE. SCROLLING DOWN THE NEWS HERE YOU CAN SEE THE DIGITAL PRE-VISUALIZATION I CREATED IN PRE PRODUCTION WHICH WAS BASED ON REAL WORLD MEASUREMENTS OF THE STUDIO AND THE BASIS OF OUR LIGHTING SETUP, ALIGNING THE CAMERA AND LIGHTING DEPARTMENTS ON LOCATION WITH THE DIRECTORS VISION TO MAKE THE PRODUCTION DAY FLUID. JUST GOES TO SHOW WITH A SMALL QUIRKY IDEA, GREAT PRE PRODUCTION AND A PROFESSIONAL TEAM ON THE SAME PAGE, BIG THINGS ARE ACHIEVABLE. THANKS TO EVERYONE INVOLVED, HERE'S THE FINAL FILM. DIGITAL PREVIS IS AN INVALUABLE TOOL TO GET EVERYBODY INVOLVED IN THE PRODUCTION ON THE SAME PAGE. THE FILM PRODUCTION PROCESS IS BASED ON COLLABORATION. WHETHER WE START WITH A SIMPLE VERBAL DESCRIPTION OR WE'RE PROVIDED WITH DETAILED STORYBOARDS, CONCEPTS AND SCRIPT, WE NEED TO MAKE SURE EVERYONE INVOLVED IS ON THE SAME PAGE. THIS ALLOWS US TO MAKE ANY CHANGES MORE QUICKLY ALONG THE WAY AND AVOID OVERCHARGES TO THE BUDGET WHICH IS VITAL TO BOTH OUR PROCESS AS WELL AS THE ENTIRE PRODUCTION. AS A PROJECT MOVES INTO PRODUCTION, THE TECHNICAL ADVANTAGES OF PREVIS BEGIN TO TAKE CENTER STAGE. 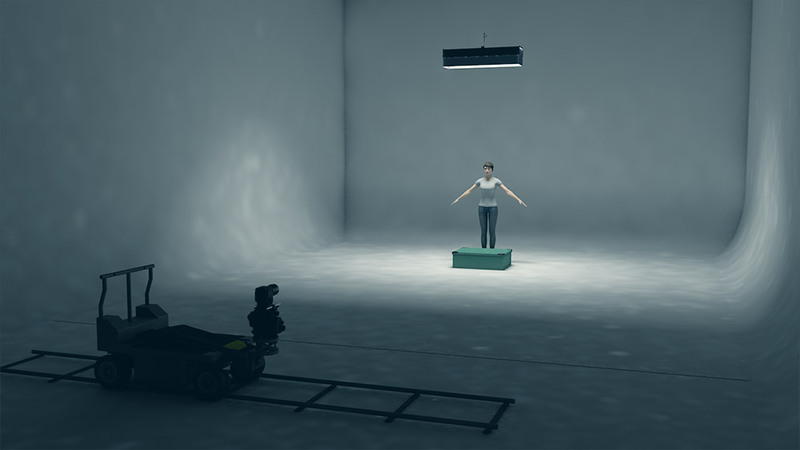 REAL-WORLD MEASUREMENTS ARE DERIVED FROM THE PREVIS SHOTS TO HELP STREAMLINE THE LIVE-ACTION SETUPS. SIMILAR SHOTS CAN BE GROUPED TOGETHER TO SAVE TIME, AND THE NEED FOR SPECIALTY EQUIPMENT, SUCH AS CRANES, CAN BE IDENTIFIED IN ADVANCE. THE PROCESS IS A WIN-WIN FOR BOTH DIRECTORS AND PRODUCERS, BECAUSE IT FOSTERS CREATIVITY AND INSURES EFFICIENCY IN THE PRODUCTION AND IN POST. BY CREATING DETAILED DIGITAL PRE-VISUALIZATION, I'M ABLE TO SHOW DIRECTORS AND CREW WHAT'S POSSIBLE LONG BEFORE WE ARRIVE ON SET.